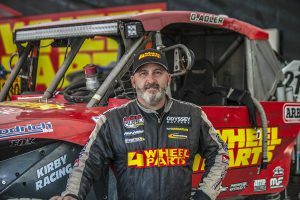 Browsing articles tagged with " Las Vegas"
Compton, California (March 7, 2017) – 4 Wheel Parts President and CEO, Greg Adler, raced to the 4400 Class win in this past weekend’s Mint 400 off-road race in the grueling desert just outside of Las Vegas, Nevada. 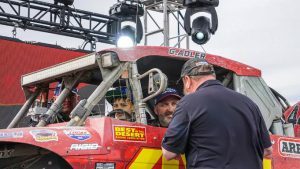 Teaming up with off-road racing icon, Rob MacCachren, the duo attacked the three 116-mile loops in a blistering time that saw them completing the 348-mile race nearly an hour ahead of their nearest competitor. The victory came just three weeks after they battled to the finish line in the King of the Hammers event in Johnson Valley, California. Taking the start, MacCachren set a pace that saw the #4444 quickly put a 20-minute gap on the field before turning the car over to Adler for the second and third laps. As the course deteriorated and became littered with vehicles that had succumbed to the desert and attrition, Adler increased the lead with each subsequent lap in bringing home the Team 4 Wheel Parts Ultra4 to the checkered flag and a resounding class win. For Adler and Team 4 Wheel Parts, the triumph put the exclamation point on a week of Mint 400 festivities that exemplified the renaissance of the iconic event as it has returned to its former glory. 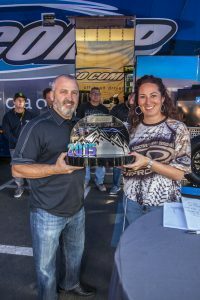 The week kicked off with the 4 Wheel Parts vehicle procession that saw the #4444 leading the field of competitors down the famed Las Vegas strip on Wednesday and continued through Friday with a festive contingency party. 4 Wheel Parts is the global leader in truck, Jeep, SUV and off-road performance products. With 78 locations across the U.S. and Canada and growing, 4 Wheel Parts Service Centers install all the products they sell. Maintaining the nation’s largest inventory of off-road tires, wheels, suspension products, and accessories, 4 Wheel Parts serves customers across the country and around the globe. Life is Better Off-Road™. Visit them at 4wheelparts.com or call toll-free 877-474-4821. 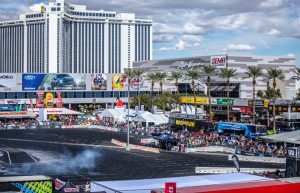 Compton, California (February 28, 2017) Global leader in off-road performance product sales and installation, 4 Wheel Parts, is among the sponsors of the Mint 400 held March 1-5 at the Nevada state line, with multiple activities scheduled in Las Vegas. 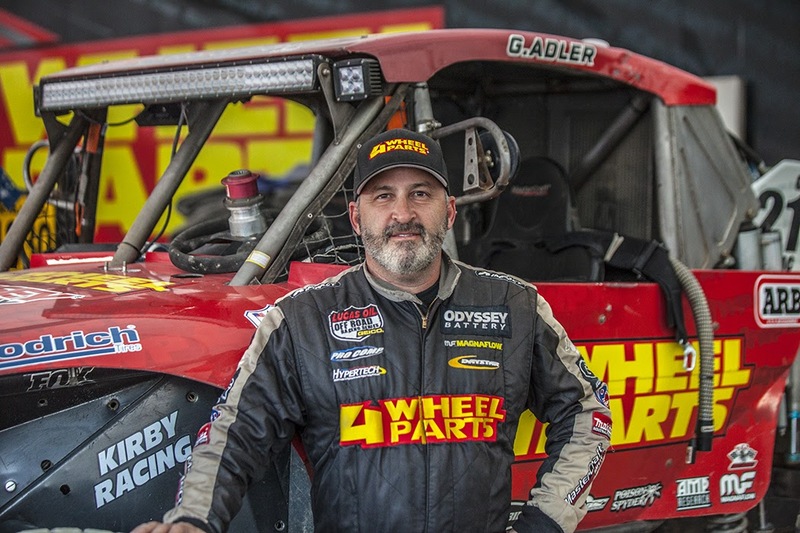 In addition to leading the vehicle procession down the famed Las Vegas Strip, 4 Wheel Parts President and CEO Greg Adler will compete in the “The Great American Off-Road Race” on Saturday, March 4. The annual Polaris RZR Mint 400 presented by BFGoodrich Tires began in 1968 with six classes and today it boasts over 20 as it attracts the sport’s elite from around the country. Team 4 Wheel Parts driver Greg Adler returns to the iconic event in his #201 4400 Class Jeep after completing the King of the Hammers Race earlier in the month. 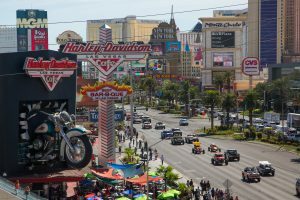 The event also marks the fifth straight year 4 Wheel Parts participates as a sponsor of the Mint 400 Vehicle Parade featuring race vehicles in a procession down the Strip on Wednesday, March 1. Powered by ODDYSSEY Battery, the 10-mile parade will give off-road enthusiasts an up close look at over 350 of the world’s most rugged off-road vehicles before they compete. Thursday, March 2 at 11 a.m., time trials sponsored by Method Race Wheels will commence and teams competing in the Pit Crew Challenge will have a chance at 7:30 that night to qualify and compete in the single elimination contest. The Limited Race gets underway at 6 a.m. Saturday, March 4, with the Unlimited class race beginning at 12:30 p.m. 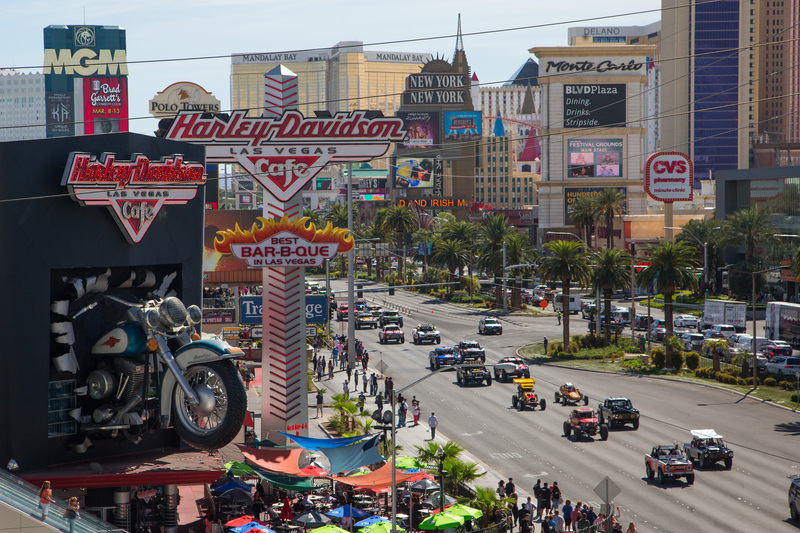 The Mint 400 began in 1968 and after a 20-year hiatus, the legendary race resumed in Las Vegas in 2008. The 400-mile battle pits the world’s premier off-road racers against each other. 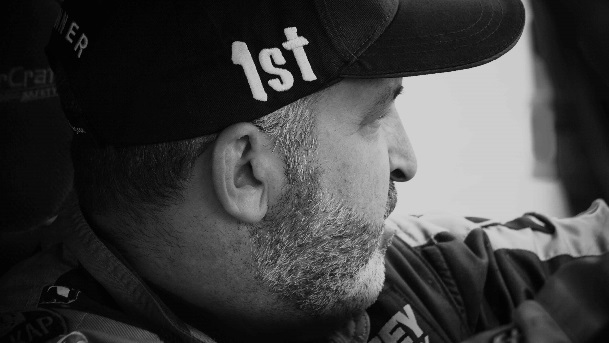 Among the stars who have competed in past races are actors Patrick Dempsey and James Garner and celebrated off-road champions Mickey Thompson and Walker Evans. 4 Wheel Parts is the global leader in truck, Jeep, SUV and off-road performance products. With 77 locations across the U.S. and Canada and growing, 4 Wheel Parts Service Centers install all the products they sell. Maintaining the nation’s largest inventory of off-road tires, wheels, suspension products, and accessories, 4 Wheel Parts serves customers across the country and around the globe. Life is Better Off-Road™. Visit them at 4wheelparts.com or call toll-free 877-474-4821. Compton, California (November 3, 2016) – Transamerican Auto Parts has named the winner in its second annual “Life is Better Off-Road™” SEMA vehicle build competition held at the 2016 SEMA automotive aftermarket industry trade show in Las Vegas, Nevada. This year’s best presented, truly off-road capable truck, Jeep or SUV on display at the show was the Daystar Products’ 1941 Dodge Powerwagon “Bootlegger,” as deemed by a panel of off-road industry experts in a ceremony held at the Pro Comp/Transamerican Auto Parts SEMA Show booth. The winning entry was revealed today at the event hosted by legendary Motocross, Supercross and off-road racing champion, Ricky Johnson. The panel of judges featured some of the most distinguished names in off-road vehicle engineering and development, fabrication, journalism and motorsports. Mark Turner of Daystar Products wanted to employ a bootlegger theme throughout the build and chose copper because it was the prime metal commonly used to make bootlegger stills. The engine sports a copper radiator hose and copper air intake while the firewall was changed to copper then covered with dynamite. Bootlegging’s roots are intertwined with NASCAR mythology and moonshine-running vehicles were made to look stock while their inner workings included supercharged engines and weighty shocks and springs to prevent sag as they transported Mason jars full of liquor. The powerwagon’s supercharged power, racing transmission, custom driveshafts and longer leaf springs made it stand out as supremely off-road capable in a field of remarkable entries ranging from Rubicons to Titan XDs. 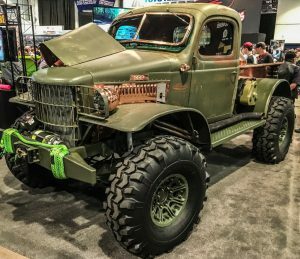 Completed in 50 days, the Bootlegger was driven to Tennessee for Whiskey & Wheeling with Xtreme Off-Road Adventure then shipped to Alaska for wheeling where it was driven on a glacier. The select panel of judges featured off-road icons and personalities including short course off-road racing Pro Lite and Pro 2 Division champion Brian Deegan, DIY fabricator and racer Bill Caswell, celebrated Trophy Truck developer and builder Rick Geiser, Content Director for the Truck Trend Network Sean P. Holman and Editor and Publisher for 4 Wheel Parts’ Off-Road Adventures magazine Craig Perronne. 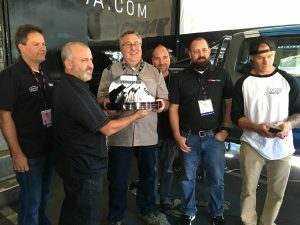 Entries were submitted up until just days before the SEMA Show began and 10 semi-finalists were selected based on criteria such as off-road reliability and capability, quality of craftsmanship, real-world functionality and overall vehicle presentation. 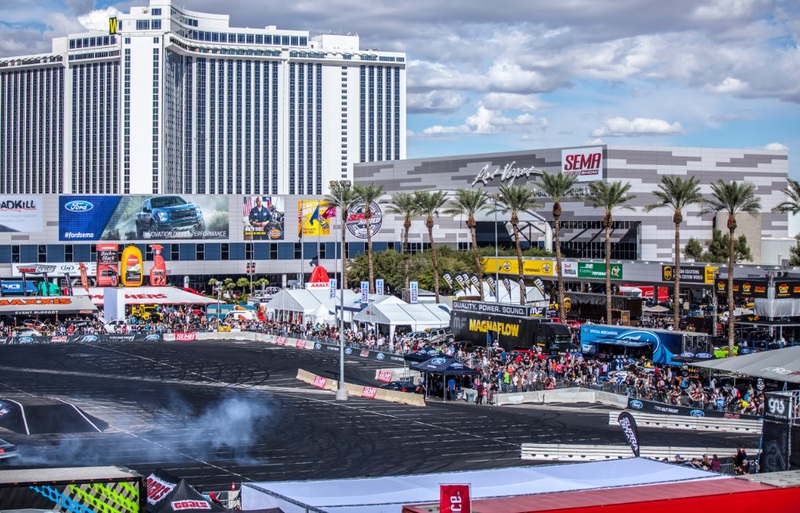 From this field, one truck/SUV and one Jeep were chosen as finalists competing to be awarded as the most authentic off-road-capable vehicle at the 2016 SEMA Show. The Bootlegger will receive a professional photo shoot and a cover feature and multi-page vehicle spotlight in ORA Magazine. Additionally, the Daystar Products vehicle will be recognized across the spectrum of Transamerican social media and digital channels, including a promotional email campaign, an invitation to be displayed in feature locations at TAP-sponsored events, tradeshows, Truck & Jeep Fests, along with the benefits of extensive partner media coverage of the award. The semi-finalists will also be included in the full media campaign and receive ribbons in recognition of their accomplishment. About Transamerican Auto Parts: Transamerican Auto Parts is the world’s leading manufacturer, wholesaler, and retailer of aftermarket parts and accessories for trucks, Jeeps, SUVs and four wheel drive vehicles. Transamerican operations are comprised of 75 4 Wheel Parts retail locations in North America, Transamerican Wholesale sales and distribution, Dealer Services International and the Transamerican Manufacturing Group which includes Smittybilt, Rubicon Express, G2 Axle & Gear, Pro Comp, LRG Wheels and Poison Spyder. We Sell It. We Own It. We Live It. For more information about Transamerican Auto Parts, Dealer Services International and Transamerican Manufacturing Group, please visit: transamericanautoparts.com. In addition to the trophy itself, the winner will receive a cover feature and multi-page vehicle spotlight in ORA Magazine, a professional photo shoot and recognition across the spectrum of Transamerican social media and digital channels. A promotional email campaign will highlight the award and winners and TAP will extend an invitation to be displayed in feature locations at TAP-sponsored events, tradeshows and Truck & Jeep Fests. The 10 semi-finalists will also be included in the full media campaign as well as receiving ribbons in recognition of the accomplishment. To submit your off-road SEMA display vehicle for award consideration, please visit www.transamericanautoparts.com/award.There you may complete your entry on-line or download the PDF application that may be completed and emailed to lifeisbetteroffroadaward@transamericanautoparts.com . For more information, complete rules, terms and conditions for the Transamerican Auto Parts “Life is Better Off-Road™” SEMA builder award please visit www.transamericanautoparts.com/award or email questions to lifeisbetteroffroadaward@transamericanautoparts.com.